Just about every home uses electricity consistently as many people have a light, computer, or some other electronic device running during all hours of the day. While many modern-day electronics and electrical systems are designed for safety, there is always a risk of electrical fires. The U.S. Fire Administration warns that over 45,000 electrical fires happen in the U.S. each year. These fires result in hundreds of injuries and deaths and cause billions of dollars in property damage. Electrical fires are also more likely to happen between midnight and 6 am which makes them extremely dangerous. Knowing the most common causes of electrical fires will help you address any issues to prevent fires from happening. The following are the most common electrical hazards that lead to fires. Overloading electrical outlets can lead to fires. Ungrounded electrical outlets are a potential fire hazard, especially if there is a power surge. You can tell if you have grounded outlets in your home very easily by looking at the number of prongs. Three-prong outlets are grounded as the third slot acts as the “ground” slot and provides excess electricity with a safe escape route in the event of a power surge. Two-prong outlets do not have a grounding mechanism and are not protected from power surges. If you have an older home that contains two-prong outlets, you must call a professional electrician for an upgrade. The electrical outlets in your kitchen and bathroom must have a ground fault circuit interrupter (GFCI). The GFCI in these outlets constantly monitors the flow of electricity and it will shut off the circuit if it detects any imbalances. This helps avoid electrical shocks or fires that can happen if the outlets encounter water. Electrical outlets with a GFCI have “Test” and “Reset” buttons on the outlet. If you do not have these types of outlets in your kitchen or bathroom, you should consider an upgrade. Faulty wiring is one of the main causes of electrical fires. However, it can be difficult to tell if the wiring in your home is outdated or faulty because most of it is behind the walls. If your home is at least 20 years old, there is a chance that the wiring system is too old to handle modern electronics like wide-screen TVs, computers, microwaves, video game consoles, and others. Circuits trip the breakers whenever they become overloaded with electricity but if the wiring is faulty, it will not trip the breakers, increasing the risk of an electrical fire. If you notice any of these signs in your home, contact a professional electrician for an inspection. 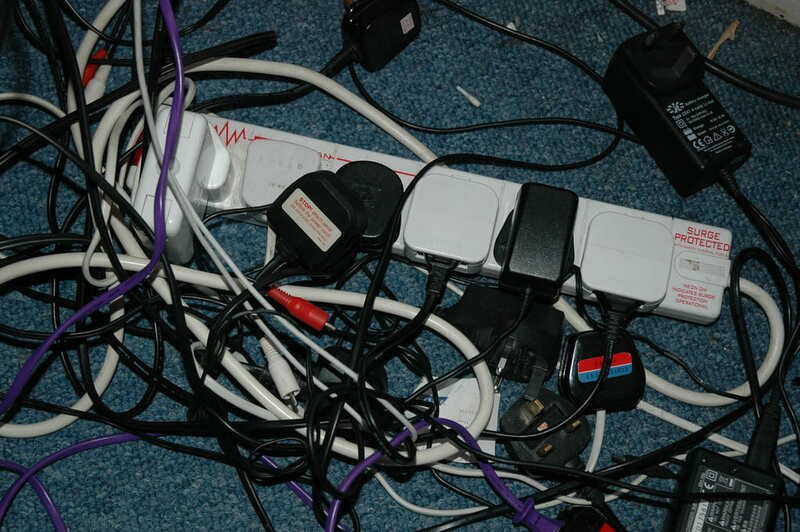 Extension cords are another common cause of electrical fires because they can overload an electrical outlet or circuit. You should never use extension cords as a permanent solution to plug multiple devices or appliances into a single outlet. Plugging electrical appliances directly into the outlet is the safest option. 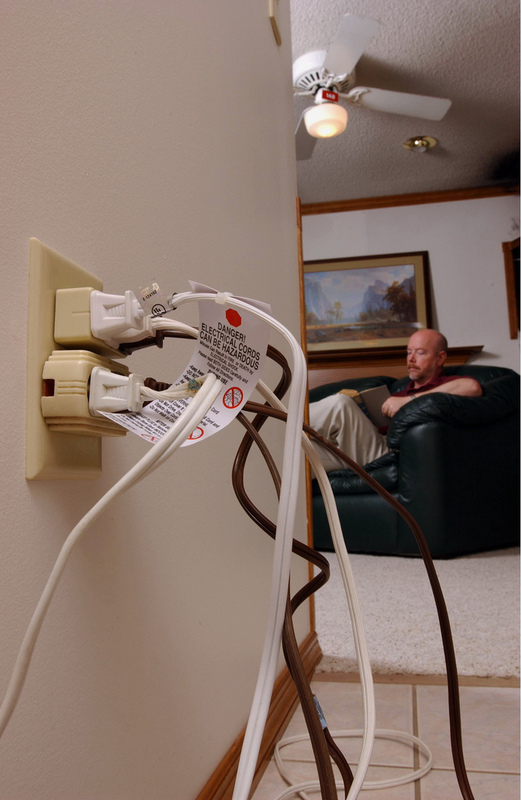 An electrician can install new grounded outlets into the wall to help you avoid excessive use of extension cords. If you must use an extension cord, do not run them under carpeting, rugs, or other potentially flammable materials. Remember that extension cord use should be temporary so make sure you seek a more permanent solution. Light fixtures and lamps become fire hazards if they have faulty wiring or if the light bulbs or outlets used do not accommodate the wattage. You should only replace light bulbs with bulbs of the recommended wattage or bulbs that have a lower wattage to avoid overheating that could lead to fires. Keep flammable materials like curtains and other textiles away from light fixtures and lamps, and do not use paper or cloth coverings over a lampshade. Many people use space heaters during the winter to make their homes a little more comfortable with some extra heat. However, space heaters are one of the biggest electrical hazards when it comes to starting fires. In fact, the U.S. Department of Energy warns that space heaters start over 25,000 fires per year in homes and around 6,000 people per year experience injuries just from touching the surface of these heaters. The coils in space heaters can quickly ignite clothing, upholstery, curtains, bedsheets, and other flammable materials. Make sure your space heater has safety features that reduce the risk of a fire and plug it directly into an electrical outlet. Keep the space heater away from flammable materials and turn it off before leaving it unattended. Check out our previous blog Preventing Electrical Fires in Your Home for more information about fire prevention. One of the biggest dangers of electrical fires is that they can happen in an instant. All types of fires, including electrical fires, can cause serious damage in a home that will only get worse until it is cleaned up and restored. If an electrical fire occurs in your home, call a trusted fire damage restoration professional immediately to repair the damage. These professionals have the right equipment to reverse the effects of an electrical fire and restore the damaged areas to their original condition.